The girls and I love Glee. Well, what I should say is that the girls and I love music. Therefore, we love watching Glee. We love hearing all the fun ways our favorite songs are interpreted and transformed. We grab the nearest microphones (hairbrushes, pens, etc.) and belt out along with the television. The “mash up” below was on a couple weeks ago and I loved the message it conveyed. Don’t get me wrong, I am totally a supporter of making the most of the medically advanced world we live in today, and there are so many people who need and deserve to alter their appearance. I just had my vein lasered remember? That was awesome. But, I truly feel so sad that the world we live in today forces so many people to feel that they must change things about themselves on the outside to conform to what society thinks is beautiful, instead of embracing what God gave you. Valuing what you inherited from your parents, rather than looking for ways to change it. Now having three daughters of my own, I struggle trying to balance what I teach them about the importance of beauty. I want to tell them how beautiful they are so that they know they are perfect just the way they are. Encouraging the growth of their self esteem so that they never feel insecure being who God made them. Hoping to enhance their confidence. But I also don’t want to put so much value in the outside appearance. I want them to always know that the most important thing in life is to treat people kindly and with respect. Being a good friend is so much more important than being a pretty friend. Do you tell them how beautiful they are, or does that only stress that beauty is important? If you don’t tell them they are pretty and perfect, does that inhibit the growth of their self esteem and confidence? “My outsides are cool. My insides are blue…..
You can buy your hair if it won’t grown. You can fix your nose if he says so. All I can hope for are three confident daughters who know who they are. Three daughters who don’t feel they need to be someone else to fit in. Three daughters with high self-esteem and positive feelings about themselves, because in the end, each one of us will be old and wrinkly one day (no matter how much Botox you inject) and will most likely think back to our youth and wish we would have loved ourselves, imperfections and all, a little bit more. After all, when you compare what you have at age 90 to what you once had, you will realize just how beautiful and perfect we really were! So how about not waiting until your 90 years old to realize just how lucky you are to be you and be grateful for what God has given you. Don’t waste any precious time unhappy with the things you can’t change, because in the end your nose and chin mean nothing at all. I feel that if everyone stopped focusing on the negative things you wish you could change, and simply focused on being the best/happy/healthiest YOU you can be, our world would be a much happier place. I triple-loved this post, Mama. Well done. You are truly one of the most beautiful people I've ever met - inside and out! 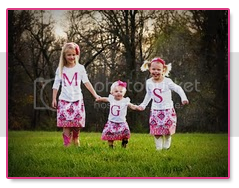 so much of what has been on my mind as well regarding my own 3 precious girls. very beautifully expressed! So glad to read this post. I am 6'2", and I hate knowing that I am the tallest person in the room. This was only made worse recently when I was told that my size and the way I carry myself make me look stuck-up. Needless to say, I appreciate the fact that you too feel the stares when you walk into a room. Beauty is so relative. I'm so sick of feeling the pressure to live up to a standard that some random person chose. Thanks for this post! I agree with HG....you are one of the most beautiful people I have ever met & you have a heart of gold!!! I also love being in a room with you because...Tall Girls UNITE! !